Ra, from the Law of One Series, explains how light energy is originally endowed in our Polaris of the self (the guiding Star), and distributed through our bodies and our energy centers (Chakras). For direct access to the Law of One Series – books 1 through 5 follow this link Law of One Series: (http://www.llresearch.org/library/the_law_of_one_pdf/the_law_of_one_pdf.aspx) Copyright © 1982 by L/L Research which is a subsidiary of the Rock Creek Research & Development Laboratories, Inc.
Now days when I meditate, whenever possible, I place my bare feet on the ground (Earth) and imagine the light – from the Planet and from my heart Chakra, joining, as I pay attention to my breath. Questioner: Prior to incarnation, as an entity becomes more aware of the process of evolution and has selected a path whether it be positive or negative, at some point the entity becomes aware of what it wants to do with respect to unblocking and balancing its energy centers. At that point it is able to program for the life experience those catalytic experiences that will aid it in its process of unblocking and balancing. Is that correct? Ra: I am Ra. We shall restate for clarity the purpose of incarnative existence is evolution of mind, body, and spirit. In order to do this it is not strictly necessary to have catalyst. However, without catalyst the desire to evolve and the faith in the process do not normally manifest and thus evolution occurs not. Therefore, catalyst is programmed and the program is designed for the mind/body/spirit complex for its unique requirements. Thus it is desirable that a mind/ body/spirit complex be aware of and hearken to the voice of its experiential catalyst, gleaning from it that which it incarnated to glean. Questioner: Then it seems that those upon the positive path as opposed to those on the negative path would have precisely the reciprocal objective in the first three rays; red, orange, and yellow. Each path would be attempting to utilize the rays in precisely the opposite manners. Is this correct? Ra: I am Ra. It is partially and even substantially correct. There is an energy in each of the centers needed to keep the mind/body/spirit complex, which is the vehicle for experience, in correct conformation and composition. Both negative and positive entities do well to reserve this small portion of each center for the maintenance of the integrity of the mind/body/spirit complex. After this point, however, it is correct that the negative will use the three lower centers for separation from and control over others by sexual means, by personal assertion, and by action in your societies. Contrary-wise, the positively oriented entity will be transmuting strong redray sexual energy into green-ray energy transfers and radiation in blue and indigo and will be similarly transmuting selfhood and place in society into energy transfer situations in which the entity may merge with and serve others and then, finally, radiate unto others without expecting any transfer in return. Questioner: Can you describe the energy that enters these energy centers? Can you describe its path from its origin, its form, and its effect? I don’t know if this is possible. Ra: The origin of all energy is the action of free will upon love. The nature of all energy is light. The means of its ingress into the mind/body/spirit complex is duple. Firstly, there is the inner light which is Polaris of the self, the guiding star. This is the birthright and true nature of all entities. This energy dwells within. The second point of ingress is the polar opposite of the North Star, shall we say, and may be seen, if you wish to use the physical body as an analog for the magnetic field, as coming through the feet from the earth and through the lower point of the spine. This point of ingress of the universal light energy is undifferentiated until it begins its filtering process through the energy centers. The requirements of each center and the efficiency with which the individual has learned to tap into the inner light determine the nature of the use made by the entity of these in-streamings. Questioner: Does experiential catalyst follow the same path? This may be a dumb question. Questioner: You mentioned in an earlier session that the experiential catalyst was first experienced by the south pole and appraised with respect to its survival value. That’s why I asked the question. Would you expand on this concept? Questioner: I’ll make this statement which may be somewhat distorted and then let you correct it. We have, coming through the feet and base of the spine, the total energy that the mind/body/spirit complex will receive in the way of what we call light. Each energy center then filters out and uses a portion of this energy, red through violet. Is this correct? Questioner: As this energy is absorbed by the energy centers at some point it is not only absorbed into the being but radiates through the energy center outwardly. I believe this begins at the blue center and also occurs in the indigo and violet? Is this correct? Ra: I am Ra. Firstly, we would state that we had not finished answering the previous query and may thus answer both in part by stating that in the fully activated entity, only that small portion of in-streaming light needed to tune the energy center is used, the great remainder being free to be channeled and attracted upwards. To answer your second question more fully we may say that it is correct that radiation without the necessity of response begins with blue ray although the green ray, being the great transitional ray, must be given all careful consideration, for until transfer of energy of all types has been experienced and mastered to a great extent, there will be blockages in the blue and indigo radiations. Again, the violet emanation is, in this context, a resource from which, through indigo, intelligent infinity may be contacted. The radiation thereof will not be violet ray but rather green, blue, or indigo depending upon the nature of the type of intelligence which infinity has brought through into discernible energy. The green ray type of radiation in this case is the healing, the blue ray the communication and inspiration, the indigo that energy of the adept which has its place in faith. 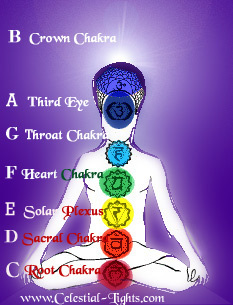 Questioner: What if a mind/body/spirit complex feels a feeling in meditation at the indigo center, what is he feeling? Ra: I am Ra. This will be the last full query of this working. One who feels this activation is one experiencing in-streamings at that energy center to be used either for the unblocking of this center, for its tuning to match the harmonics of its other energy centers, or to activate the gateway to intelligent infinity. We cannot be specific for each of these three workings is experienced by the entity which feels this physical complex distortion. Is there a brief query before we leave this instrument? Questioner: I just would ask if there is anything that we can do to make the instrument more comfortable or to improve the contact? Ra: I am Ra. Please be aware of the need for the support of the instrument’s neck. All is well. I leave you, my friends, in the love and in the light of the one infinite Creator. Go forth, then, rejoicing in the power and the peace of the one infinite Creator.